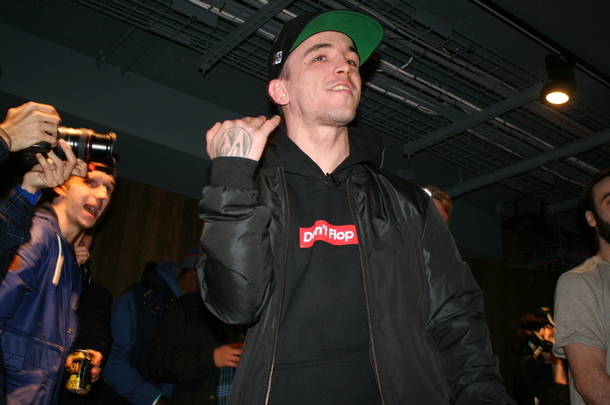 Kingpen here to bring you my recap of Don't Flop's 8BW weekend. First of all, big salute to Eurgh, Cruger, Liam and the whole DF staff for putting together one of the biggest events of the year. I was in the building for all three days and each day definitely had some standout moments. So what I am going to do here is give you my brief recap of the battles from the Day 2 main event card, and then my favorite moments of the entire weekend from all 3 days. I've seen both of these guys live before. Juan's performance vs. Charron was probably a career performance and I don't think he matched that showing in this battle. But he had some great material. Oshea was ... Oshea. Hilarious. Easily one of my favorite battlers in the world just off entertainment value. Ive seen him three or four times and he is consistently something to see. Oshea 2-1. Honestly, who knew that Marlo and Shuffle-T were just as dangerous individually as they are together? Shuffle has had some very dope performances this year against Heretic and 100 Bulletz, and Marlo had a very good Bunker debut in California against Deadman and was now against Ogmios, who I believe to be both underrated and extremely dangerous when he mixes more humor into his content. Overall I felt the battle had some dry spots, and didn't connect with the crowd at all times, but I felt Marlo had better angles, and a better overall performance. To me he was much more entertaining, and way funnier. Marlo 2-1. Yeah, I know. Chilla is going to give the nod to his Writers Bloque buddy right? Look, Ark was phenomenal. The crowd slept on him something crazy in rounds 2 and 3 where he had a VERY nice Biggie scheme, some creative angles and nameflips. Part of me wonders though if it was Danja Zone whose vocal projection and energetic performance at the top of round 2 may have sucked the energy out of the room. This one wasn't a CLEAR win live for either as they both were sharper than expected, but I'd expect Danja to take it on camera. I am EDGING Danja 2-1 in a debatable battle. In possibly the most heavily self-promoted battle on the card, Charron and I lived up to our pre-battle banter and really put on a show for the crowd in Leeds. This battle has everything: rebuttals, angles, grime, punchlines, schemes, jokes, props and everything else you could possibly want. Light-hearted but competitive. This one is another very debatable battle where we both relied on and showcased our strengths but also displayed some unexpected versatility that the crowd really enjoyed. I think I got it 2-1 (obviously) in one of the top battles of the night. MAN. This battle right here. Look, I'll be honest. Sometimes it's tough for me as an American to really understand everything either of these guys is saying. And I am pretty good with dialects in general (That's a bar, by the way). Even some of the fans were asking me for help understanding the bars, especially with Soul. But despite that, two things were made very clear. 1: Quill at 100% is probably Top 5 most dangerous in the U.K.
2: Soul at 100% is probably Top 5 most dangerous in the WORLD. I realize Soul may never rank high in America as a writer or battler due to his accent but, for those who can appreciate his greatness, he is something to see. This all will probably be used against me when we have our inevitable clash lol, but I won't let that sway how I feel. Quill set the bar very high. So high I wasn't sure Soul could match it. And after a slightly slow start, Soul ... just floated over it, with haymaker, after haymaker, after haymaker. This one is probably debatable to most. I have Soul taking it though. 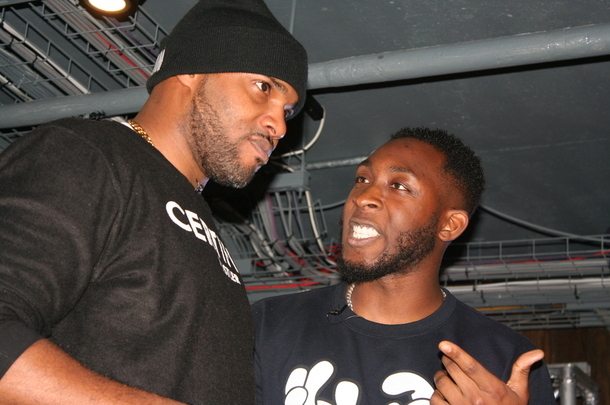 Gjonaj, one of battle rap's fastest growing emcees makes his first Don't Flop appearance against Raptor, who was looking to rebound from a clear loss to Soul about half a year ago. For what it's worth, Gjonaj is extremely talented. Has a unique sound. Distinct style. Bar heavy. Cares about his craft and is hungry. He shows all of that against Raptor. Problem is, Raptor looked like he had something to prove. For the first two rounds they traded bombs back and forth. To me this was easily Raptor's best writing to date, while I thought Gjonaj's first two were a little below his usually very high standards, especially round 2. His third however, may have been the round of the event. He rocked the room consistently for about two solid minutes and took that clear. The first two were up for grabs though, and after rewatching the PPV, I may have Raptor edging those. On more watches that could change. Either way it's probably a stock riser for both. Raptor 2-1. Due to Shox and Lu Cipher not being able to make to the event, the DF staff threw a one-round battle of the giants together, and considering the short notice it was very entertaining. Though it was one round, this was the best I've seen Math in a very long time. He went first, and was on 100 for most of the battle, owning the crowd. Dialect started off shaky with a stumble or two, then picked up and dropped some fire bars. The stumbles were the deciding factor for me, but may not be a big enough slip for most others to penalize his round. But I had Math taking it 1-0. In the main event and most anticipated battle of the night, Pat Stay proved his critics and doubters wrong about his supposed decline and brought three VERY polished rounds against Tony. Potentially, it was Pat's best all around showing all year. For 2 rounds, Tony was ... Tony. Charismatic, witty, strategic and everything else we've come to know and love Tony for. 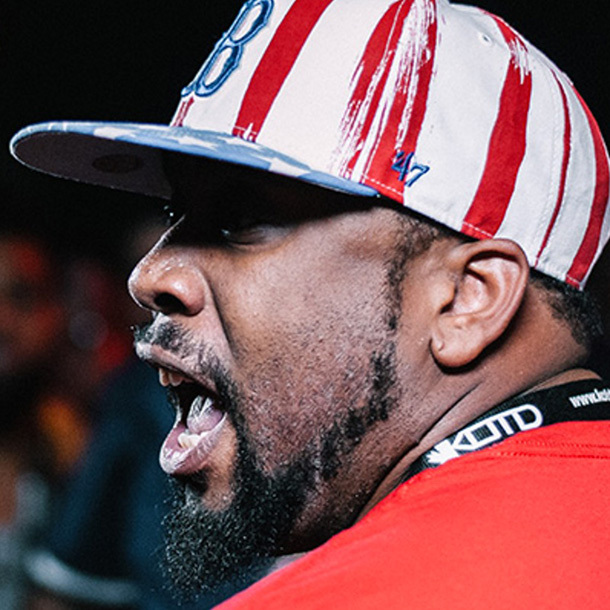 Pat had a strong third but ended a bit weak and it felt as if he may have left the door open for Tony to steal the W. And then the unthinkable happened: After Pat just spent half a round ridiculing Tony over one of the most infamous chokes in battle rap history vs. Real Deal, and only about eight bars into the third round, Tony chokes. And it's not like a, two or three second choke where he rebounds gracefully ... it's a 10 to 15 second choke where a deafening silence falls over the crowd. Reminded me of Lux at "Summer Madness 2," when people couldn't believe what they were seeing as he repeated "Harlem Hospital giving beds out." He does end up back on track with a strong finish, but he possibly ruined a classic. There were a lot of people in the building who had Tony winning the first two rounds. I wasn't one. Pat 2-1. To reiterate, Tony wasn't bad at ALL. Just one down moment. Happens to the best of us. Swave Sevah vs Gemini didn't go down due to unforeseen circumstances on Gemini's side. Really wanted to see Swave in action. He was locked, loaded and ready for war. Hopefully it gets rescheduled along with Math vs. Shox and Lu Cipher vs. Dialect. Now, my favorite moments of the entire weekend. -Starts round "I said, yo"
I noticed people actually actively following Pedros round and marking the appropriate spaces off. Not sure anyone actually got Bingo, but it was a great gimmick. The grudge match of the century. For a year, Big T has joked on, toyed with, and pretty much made all types of fun of Rob Wilson. It started with Rob's trainwreck of a third round vs. Innuendo at 7BW weekend (go watch it if you've never seen). This brought us to the Day 1 main event which was a fun, spirited one-rounder between two polar opposites. Rob was laid back, casual and at times ... awkward. Which is his lane, really. And Big T was bar heavy, energetic and aggressive. Their styles of humor played very well off each other. Very fun battle live and I think it'll translate to a good watch on camera. Last time we saw Raptor, Soul was rapping circles around him. The crowd was very interested to see what type of form he would come back in. And man did he show up. Gjonaj was Gjonaj, but Raptor seemed to go especially hard in this one, wanting to remind people what he's capable of. He also sent a shot to Gemini, which may set up the idea of a future high-energy and aggression-filled rematch. Raptor was on point for this one and had one of my own personal favorite performances of the night. On Day 1, Math had the idea of roasting Rob Wilson's boots after his battle. Soon, Danja Zone, Big T and eventually Swave jumped in and it became a hit on my Instagram page. Luckily for us, Rob didn't retaliate and was a great sport about it. Little did Soul know, this wouldn't be the last boot roasting of the weekend. Danja Zone and I roasted the SOLE off of Soul's boots for about 60 seconds with freestyle jokes. Soul at one point even jumps OUT of his boots and walks off stage as we continue to roast the boots. It was one of the moments that people who were there are going to remember forever, and its gonna be one of those moments where people who watch the battle are gonna skip to just for that. It was THAT epic. So that's it. My 8BW Day 2 recap and my biggest moments of the weekend. 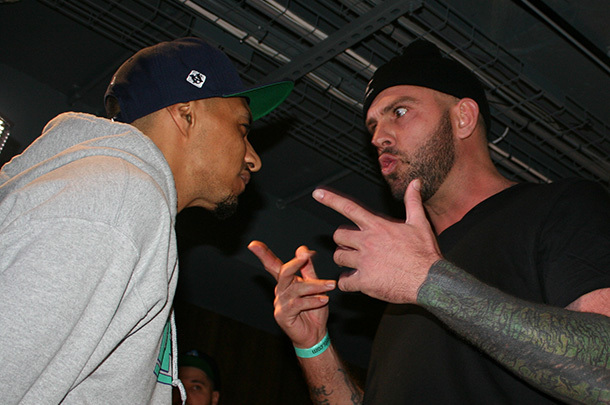 Be sure to go grab the PPV from Don't Flop to see all of the weekend's great battles such as Tony D vs. Pat Stay, Soul vs. Quill, Raptor vs. Gjonaj, Charron vs. Chilla and more! Follow me on Twitter & Instagram @chillajones and go to www.chillajones.com for all things #Kingpen including Kingpen shirts, tees, hoodies and slides. This is Chilla Jones signing out. BOSSTOWN! 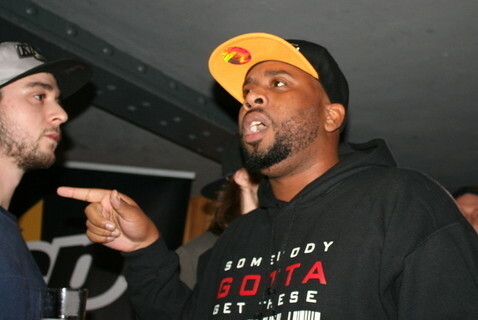 Chilla Jones hails from Boston and is an emcee and battle rapper. He has faced off against the likes of B Magic, Daylyt and Conceited (and many more) on platforms including URL, KOTD, RBE and Don't Flop. Download his album at ChillaJones.com.